On Ash Wednesday, we bring up a very special box from the basement. It contains a dozen hand painted real hens eggs. We hang them from branches in the dining room. Always in the dining room. 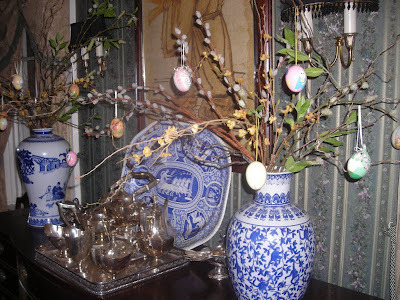 On a Lenten trip to Germany many years ago, we were charmed by their custom of the "Easter Egg Tree". We always stayed in bed and breakfasts and each seemed to have a vase full of spring branches from which they hung painted eggs. 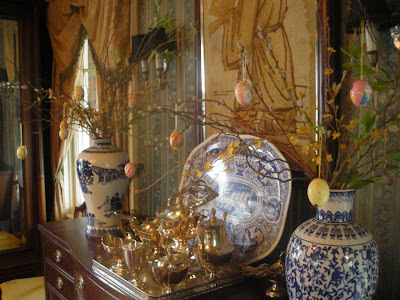 That's why our Easter Egg Tree is always in the dining room! When asking one of our hosts where one might find these eggs, we were told "Woolworths" -- and so to Woolworth's we went about mid trip. We chose a dozen eggs to bring home. The cost -- $12! Every year since, we've hung our German Easter eggs on Ash Wednesday. They're a reminder of a special time, of many special places we visited, and we cherish each and every one. The dining room table is reserved for the Easter lilies we'll buy the week before Easter. As poinsettias are for Christmas so are the lilies for Easter. It was a rite of my mother's and it is a rite of mine as well. 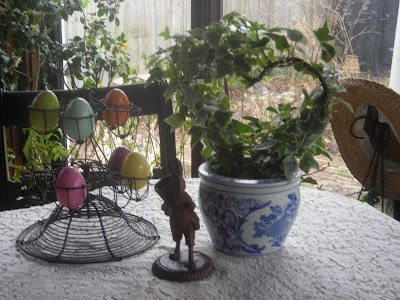 The breakfast room table, however, has my French wire egg holder with some Williams Sonoma Alabaster eggs that I got at a deep deep discount one year after Christmas, an ivy topiary and an iron rabbit -- my latest rabbit. 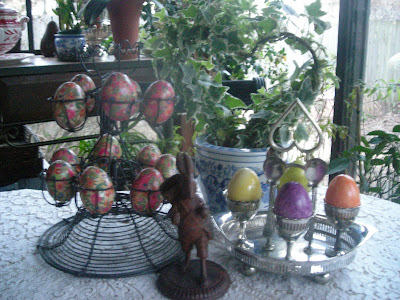 On a recent trip to the city, we went to Pottery Barn and found these lovely eggs which I placed in the egg holder. From the dining room, I got out one of my silver boiled egg serving pieces (complete with "egg spoons") and decided that they would be a great holder for the Alabaster eggs. Forsythia is in vases in the living room -- my nod to spring but not necessarily Easter. From the reds and greens of Christmas, the bright yellow of the forsythia is like a ray of sunshine after the dreary winter. We enjoy our eggs, both new and old. They're part of Linderhof's traditions. Your silver egg holder with spoons is quite lovely. I enjoyed your story of the german custom of hanging eggs on branches. Thanks for sharing. Love your egg vignettes....beautiful home! What a lovely tradition! I remember growing up and delicately blowing out the contents of eggs with my Mom so we could paint them and hang them on a tree. You have to be very careful, and take a sharp pin and put a hole at both ends of the egg. Sometimes we would decorate them with tissue paper, or just paint a design on them, then glue a loop of ribbon on them. So many nice traditions to pass on to each generation! I adore you lovely Linderhof. Every think looks so beautiful. I thought it was an English home until I read your blog header. Your eggs and the way you decorated with them and the story of the egg trees was delightful. What lovely and treasured memories. Thanks for sharing. Just beautiful, Martha. What a lovely tradition. I have an award for you. Stop by when you can to pick it up. Your eggs are beautiful. They make great decorations at this time of year. These are som great ideas! I love your egg tree and the new rabbit! Just wanted to stop by to say thank you for coming by and taking a peek at my apothecary jar project! Thank you for your kind comments! Oh...I just love the story about your handpainted eggs from Germany! They are beautiful and I love how you hung them on the little Easter trees! All of your decorated Easter eggs are gorgeous...you have quite the collection going! Your beautiful silver egg server really caught my attention...so beautiful!!! What a sweet tradition. I do love the eggs hung on real branches instead of the fake little Easter trees sold at Michaels. This looks so pretty in that urn! And as you said, the memories of those special times in Germany are the best part of that tradition. Love it when things like that bring those happy times flooding into your heart & mind. 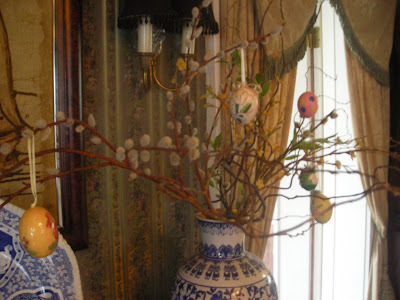 We, too, brought the tradition of an Easter Egg tree home with us from Germany many years ago. Some years I'm able to find forsythia to add to the egg bouquet, but this year has been too cold and the bright yellow is still tight in the bud. I wanted to let you know that I roasted a chicken last night according to your directions. It was delicious. You know, we raise our own hens, and I'd always thought I had the best and easiest recipe for roasting a hen - I've learned something new. Thank you!